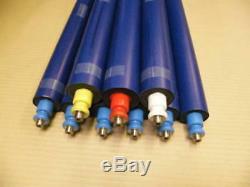 SET OF GTO 52 INKING ROLLERS x9 IN TOTAL. THESE ROLLERS COME READY TO RUN AND INCLUDE BEARINGS. Specialist in the UK, offering high quality parts at Superstore low prices. We offer all spares for these machines , as well as new and used machinery and service. Originated in 1996 as part of the former UK Ryobi agent. We are specialists in Printing machinery. All our replacement parts are as good as originals or better! Where we cannot offer replacement parts we can offer original parts often up to 60% cheaper than the main agent. The item "GTO52 INKING ROLLER SET 6 BLUE 1 RED WHITE YELLOW READY TO RUN" is in sale since Wednesday, November 7, 2018. This item is in the category "Business, Office & Industrial\Printing & Graphic Arts\Printing & Graphic Essentials". The seller is "printerssuperstore" and is located in Leeds. This item can be shipped worldwide.